It is not known how much was raised for the Saskatchewan Junior Hockey League’s Assistance Program following the fifth annual Fan Expo held in Regina recently, but if the size of the crowds is any indication then it could be substantial. More than 15,000 people flocked to Evraz Place for the cultural event that puts a spotlight on new technologies, gaming and comics among other activities. Several celebrities were also in attendance with Kristy Swanson from Buffy the Vampire Slayer headlining that list. 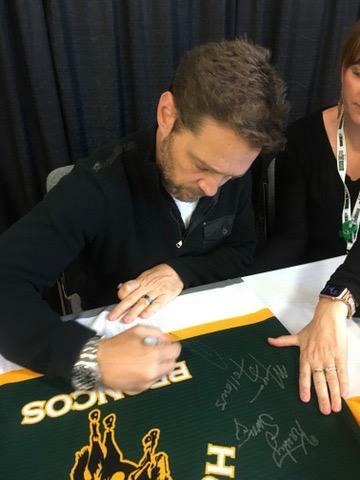 Normally celebrities charge a fee to have their photo taken with fans, but at this event that fee was waived in lieu of donations for the assistance fund recently established by the SJHL. The SJHL assistance program was set up following the Humboldt Broncos bus crash to help with long-term healing and mental health issues for all of those who were impacted by the tragedy. Federated Co-op, along with all of its member retailers, have been major donors to the program, which is in place for families, players, billet families and victim families to seek any assistance needed to try and and recover from the shock and trauma brought on by the incident. Fan Expo’s assistance and recognition of the program is greatly appreciated by the SJHL.